Health vulnerability to heat stress in rural communities of the semi-arid regions of Maharashtra, India. Home › Learn › Articles › Health vulnerability to heat stress in rural communities of the semi-arid regions of Maharashtra, India. Summer temperatures in India have been rising over the last few decades, resulting in increased heat-related mortalities. Future climate projections indicate an increase in the duration and frequency of heat waves. Rural communities are vulnerable to heat stress, particularly during peak heat hours: men in the age group 31-60 years working outdoors; individuals engaged in hard physical work, such as farmers and labourers; those residing in tin roof houses; and those having pre-existing health conditions, are particularly vulnerable. The rural health infrastructure needs to be capacitated and upgraded to effectively handle heat stress related illnesses. The development of a health surveillance mechanism to monitor heat-related morbidity and mortality is required for quick action. Priority should be given to the development of a comprehensive state-level heat action plan for Maharashtra, which addresses the urban and rural communities. This policy brief* highlights the varied risks and responses to heat stress among the different social categories in the rural communities in the semi-arid region of Maharashtra, thereby identifying the vulnerable groups as well as the important factors that affect vulnerability to heat stress. *Download the full brief from the right-hand column. Find an overview of the key findings and recommendations from the brief below. Increasing summer temperatures are likely to impact human health. In India, an increase in severe heat wave days per year has been observed over the past few decades. This is associated with a steady increase in mortality over the decades. Heat-related mortality increased from 612 in 1992 to 2422 in 2015. As a matter of fact, 40% of all the deaths related to extreme weather in 2016 were due to severe heat waves. Future climate projections for India indicate that heat waves will likely be more intense, have longer durations, and occur more often and earlier in the year. In India, it is only in the recent years that heat action plans have been prepared at state level (e.g. Uttar Pradesh, Andhra Pradesh, Orissa and Telangana), city level (e.g. Ahmedabad, Nagpur) and district level (e.g. Hazaribaug in Jharkhand state). At present, to understand the impact of heat stress, most studies have been concentrated in urban areas and few occupational settings. However, there is little evidence of the heat stress experience, impact of heat exposure, and adaptation measures to heat and heat waves in the rural context. Vulnerability is conceptualised as a function of the interacting biophysical and socioeconomic determinants that can be broken down into heat hazard probability, as well as factors associated with population exposure, susceptibility and adaptive capacity. Vulnerability is seen in the context of occurrence of heat-related symptoms (HRS). The occurrence of at least one HRS was the health outcome of interest. HRS can be considered as mild (small blisters or pimples, dry mouth, fatigue, leg cramps, heavy sweating, intense thirst, rapid heartbeat, headache, leg swelling, paranoid feeling and swelling of face) or severe (hallucinations, fainting and vomiting). Men are found to be more affected than women due to longer exposure to outdoor heat. Adults between 31-59 years of age, who are engaged in manual work related livelihood activities, are more affected than other age groups. Higher number of individuals from the ‘very poor’ and ‘poor’ categories experience HRS as compared to the others. Pre-existing health conditions Individuals suffering from pre-existing chronic health condition are disproportionately affected as compared to those not having any pre-existing health condition. The manual work population of adults is exposed to direct sunlight outdoors, whereas elderly and children are exposed to hot indoor environments during afternoons, due to faulty building designs and material. Women are exposed to high indoor temperatures during cooking and performing household chores. 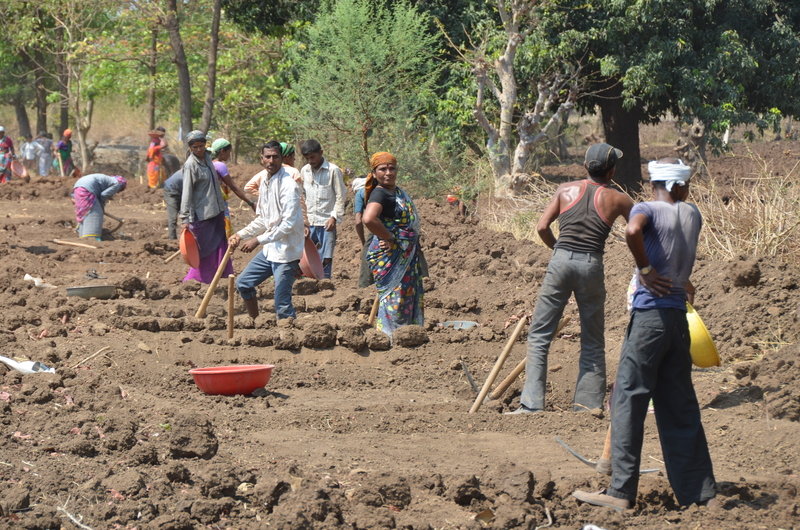 Individuals engaged in manual labour (agriculture and nonagriculture), MGNREGS and farming are more affected. Those living in households with tin roofs are more affected than those living in houses with cement roofs. Heat-related symptoms can serve as useful indicators of early heat stress. They are easily recognised by the ordinary person and can be used for early identification and prevention of more serious impacts such as heat stroke. Effective planning through the development of a surveillance mechanism in rural areas to monitor heat-related morbidity and mortality, will help in mitigating and avoiding heat-related stresses and deaths in the future. Improving health systems will benefit all – not just in the context of heat-related illnesses, but all illnesses – hence this will be a no-regret intervention. Infrastructure in primary health centres should be upgraded to respond to heat stress in peak summer months. • Improving housing designs using low-cost measures, particularly that aim at improving ventilation and reducing indoor heat exposure due to tin roofs, should be given priority, especially through existing government housing schemes. Outdoor labour work during peak heat hours, such as at MGNREGS and construction sites, should be avoided. The work could be rescheduled at early morning or late evening. There is a need for pre-emptive strategies to ensure that people in areas where heat waves are not yet a phenomenon, are adequately supported to reduce their vulnerability. Community awareness to heat stress should be improved so that they can take adequate precautionary measures. Maharashtra does not have a state-level heat action plan. Therefore, priority should be given to the development of a comprehensive state-level heat action plan which addresses the urban and rural communities. Heat stress: How does one recognise heat stress? What should you do when a person suffers from heat stress? This infographic illustrates the impacts of different levels of global warming on the local climate extremes and the vulnerable sectors of Ethiopia. Religion and tradition can act as barriers to the effective behavioural change needed for adaptation. However these can also be used to leverage local practices for better uptake of adaptation.